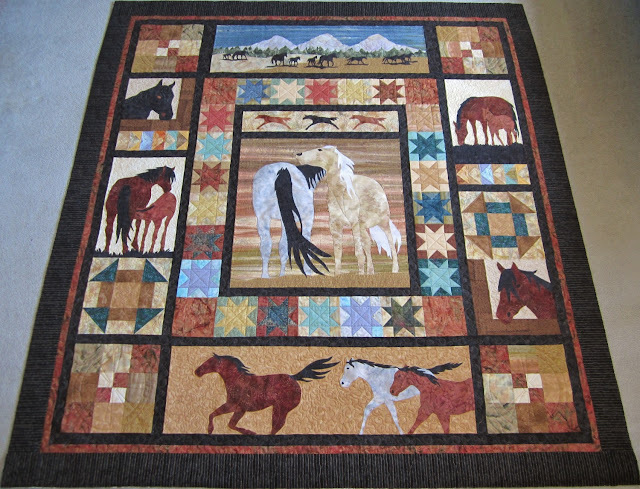 First of all I have to say that I love this quilt and was so excited when my client brought it to me. I can not imagine the time that it took to piece and applique but the very lucky grand daughter that received it must know how much she is loved. I had a lot of fun quilting this quilt. 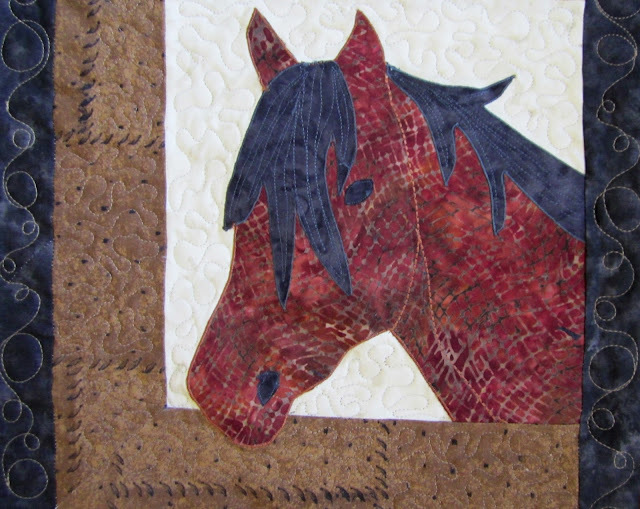 Being that there are several different sections, some with traditional pieced blocks and others with applique, it lent itself well to different types of quilting. So I was able to do some free motion quilting and use some computerized patterns. I think that out of the whole quilt this section is my favourite, that is if you can really pick a favourite as it is all so beautiful. Here are some close ups so you can see the detail of the free motion quilting. 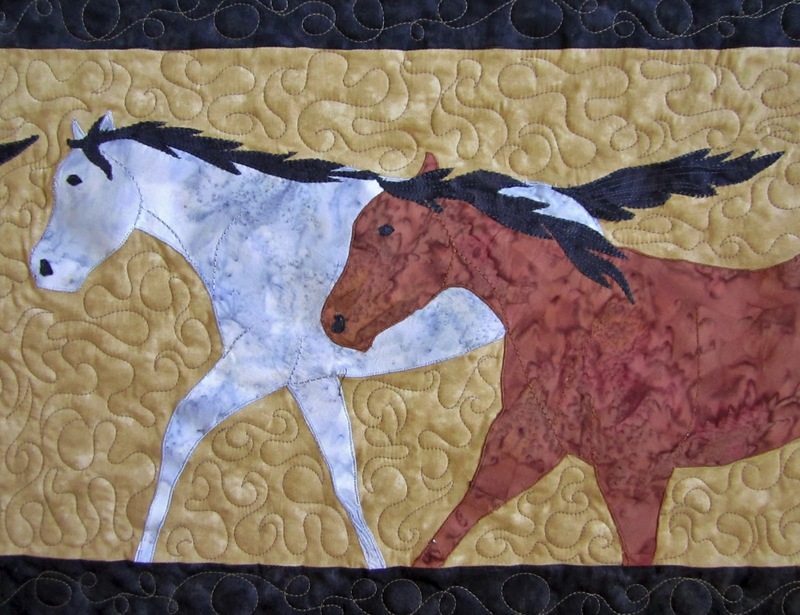 Now some shots of the free motion quilting around the appliqued horses. Here are some pictures of the computerized quilting on the traditional blocks. Computerized meaning that some of the quilting is done using a pattern, like the wagon wheel, cowboy boots, evergreen trees and such. 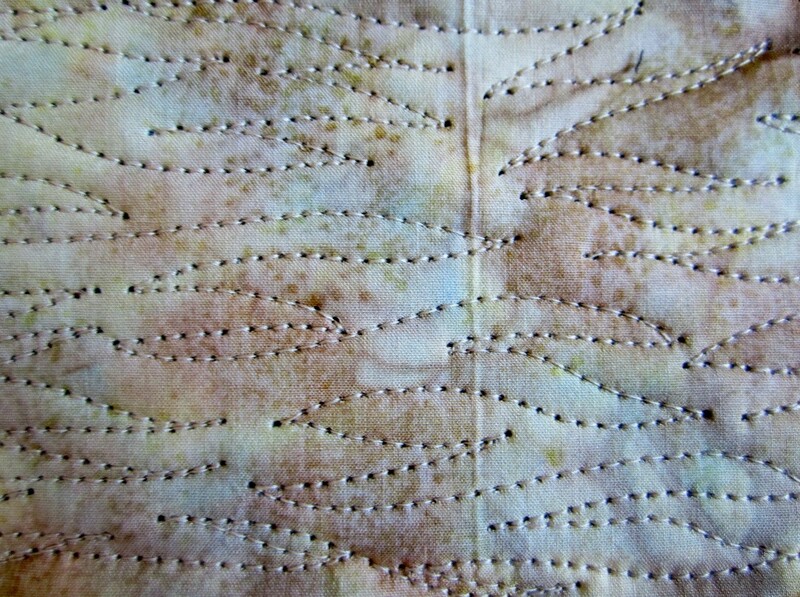 Others like the stars and triangles I marked where I want the machine to stitch using a laser and the machine stitches it. A very handy feature indeed. 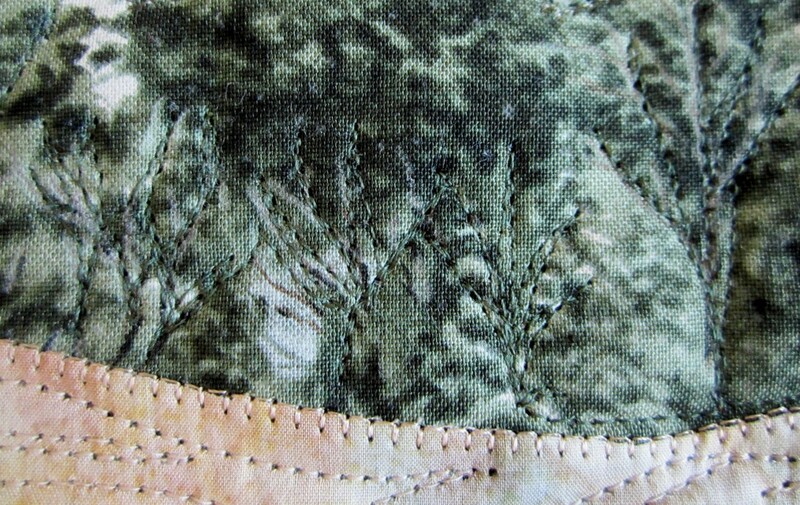 Here is a shot of the border, it also is sewn free motion. Well here's my baby. A state of the art Gammill with a fully computerized Statler Stitcher system. The frame is 14 feet long and it can fit any size quilt from a small baby quilt to an oversized king. 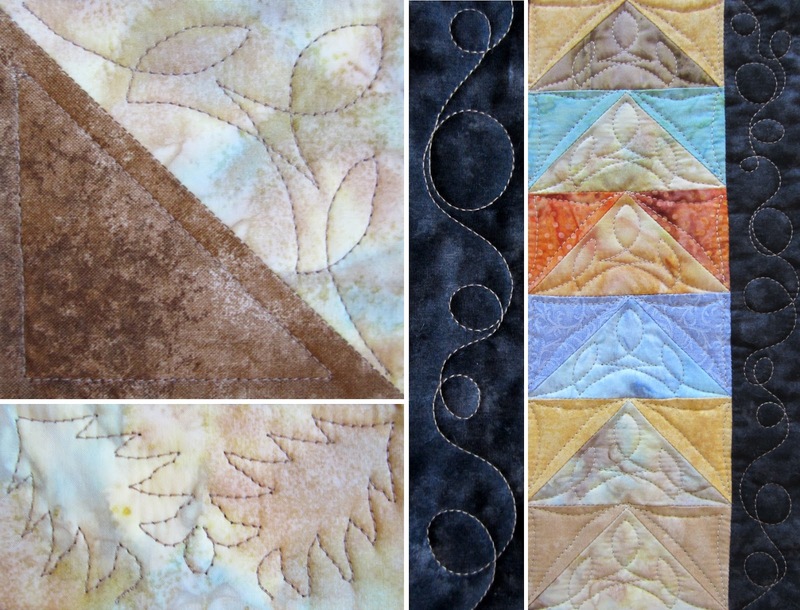 With my Statler I can quilt anything from a basic edge to edge design to a fully customized quilt. I can even use it free hand if I wish. This machine allows me so much creativity that I can literally do anything I can dream up. It's been a lot of fun learning how to use it. Okay, it was a little frustrating and there were a few tears but the quilts that I have turned out on this baby are amazing. I love my Statler Stitcher! 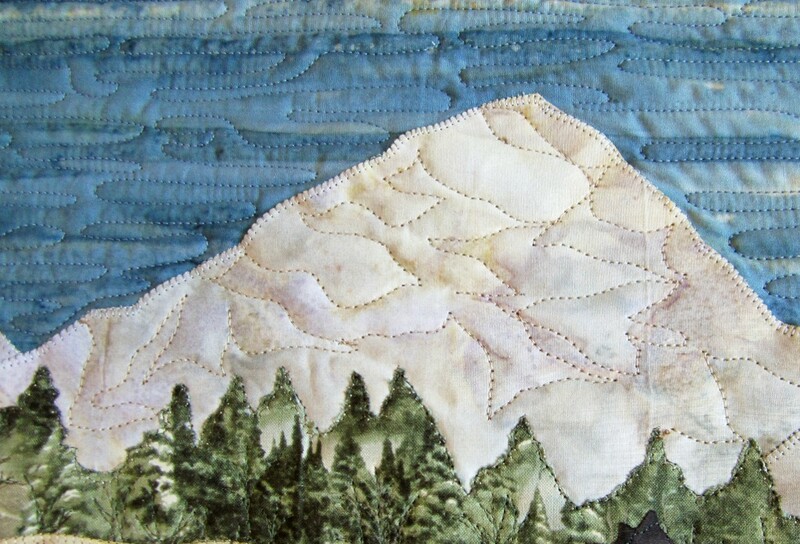 I thought that it would be appropriate to make my first post in honour of the talented creator of the QUILT featured on the header of my blog. She is very skilled at piecing and has an amazing sense of colour. It is always such a joy to work on her finished master pieces. This QUILT has special meaning and I was touched by the story behind it. You see, it was one that was started by her sister who recently passed away, and out of love she took it home and finished it for her sister's daughter. What a treasured keepsake. This QUILT is already an heirloom. It brings tears to my eyes just thinking about it. A labour of love for sure. Thank-you for entrusting it to me to QUILT. It truly was an honour. I love the way the QUILTING turned out. Not only is this customer excellent at choosing fabrics and matching up colours nicely, but she also has a talent for picking the perfect pattern to QUILT on her quilts as well. Here is a shot of the back of the QUILT. To me, the QUILTED back should be just as beautiful as the QUILTED top. It looks so nice when the thread stands out to show off the pattern. I really like the backing fabric and how it is speckled with bits of colour here and there. Here is the pattern that I used on this quilt. It is an edge to edge pattern and is called Jacobean. It is simple but very pretty quilted.